Pineapple Cake Recipe makes an old fashioned pineapple cake. It is a layer cake from scratch, with a Pineapple Buttercream Frosting. Long ago, when someone said they had made a cake "from scratch", they meant they had not used a recipe that was written down on paper. Today it means you didn't use a boxed cake mix. Folks made cakes by putting ingredients together, taste-testing as they worked. The formula was only written in their heads. One learned cake making by watching. This is the way I saw Mama do it! Mix cake according to Vanilla Cake Recipe instructions. Bake in two 8" prepared cake pans. While the cake layers are cooling, stir the pineapple with it's juice and the sugar in a saucepan on medium heat. Cook while stirring until sugar is dissolved. Do Not Boil. Remove from heat. Place one layer of cake upside down on a plate. Punch about 10 holes in it with a toothpick. Spread one third of the hot pineapple mixture on top. Repeat procedure with the other layer, placing it on with the top side up. Spoon remaining pineapple and juice on top of cake leaving about 1 inch space around edges, if you plan to frost the cake. Otherwise cover the entire top with the pineapple. Let cake cool thoroughly. Cover or wrap loosely in plastic wrap. Refrigerate for a few hours. Cake can be removed from refrigerator and allowed to reach room temperature before serving. Or frost with the following yummy frosting. Reduce mixer speed to low and add powdered sugar a little at a time, mixing well after each addition. Cream Butter and cream cheese together in mixer on high speed. Stir in pineapple and vanilla flavoring. After each addition is incorporated into mixture, turn speed to high and mix for a minute. This prevents the sugar from flying out of the bowl. Mix in a couple drops of the food coloring at a time, until the desired shade of color is attained, if desired. Gently fold in the whipped cream topping until well mixed. Frost the sides and around the outer edges on top of the cake. You can frost all of the top if you prefer. There is enough frosting for that. If you prefer to leave the ring of pineapple showing as in the above picture, you will have about 1 1/2 cups frosting leftover. Refrigerate or freeze leftover frosting for use on another cake. 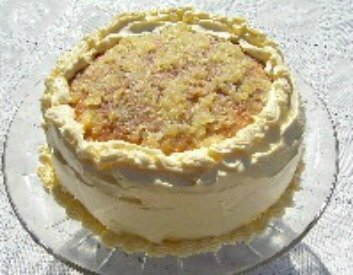 This Pineapple Cake Recipe frosting is wonderful on pineapple or vanilla cupcakes.